Rocky Knob Cabin is a log cabin overlooking beautiful Brasstown Valley in Young Harris, Georgia. Located on the mountain above Brasstown Valley Resort, Rocky Knob Cabin offers a lovely mountain-top view of the Blue Ridge Mountains with beautiful spring and summer sunsets, and in the fall and winter, 180 degree panoramic views. It is cozy with all amenities for a relaxing stay. All roads leading to the cabin, including the driveway, are fully paved and in good condition. The cabin easily accommodates four people in its' two bedrooms, two baths, living and dining area and its' fully equipped kitchen. The master bedroom has a queen size bed, and the guest bedroom has two twin beds. Both bedrooms have on suite baths. There is a new flat screen TV in the living area and Netflix available to our guests. There is a gas grill on the wrap around deck along with a bar height dining table/chairs with umbrella. Coffee is provided for our guests, and the kitchen is fully equipped and stocked with everything you need to make a wonderful meal at home. The cabin is equipped with Wi-Fi. Washer and dryer are available for guests' use during their stay and detergent/bleach is provided. Beautiful Lake Chatuge and The Georgia Mountain Fairground are about 3 miles from the cabin. It is conveniently and centrally located for day trips to Blue Ridge, Franklin, Murphy, Bryson City, Blairsville, Hayesville, Helen, Brasstown Bald, Dahlonega and close to many hiking locations, wineries, boating and shopping. Stay as busy as you like, or stay in and relax! We hope to have you stay with us! * $100 Deposit Required To Confirm Reservation. * Full Amount Due 30 Days Prior to Arrival. We live in upstate South Carolina, and Young Harris is the perfect place for a vacation home. We never tire of the beautiful and relatively short drive . The short distance allows us to enjoy the cabin ourselves on short notice and also enables us to keep everything in tip top shape. David and I became familiar with this beautiful area when his sister and husband moved up from Amelia Island. In visiting with them, we felt a real connection with the area and began toying with the idea of purchasing our own place. In 2008, it became a reality, and we purchased Rocky Knob cabin from a local couple. We love our place and enjoy sharing its' "magic" with others. The cabin is on one level with a ramp/walkway from the driveway to the house, providing easy access. Fully equipped kitchen with most pantry items as well as crock pot, blender, mixer, regular coffee pot & single serve Keurig. Coffee & Sweeteners. Pure Water Filter on kitchen faucet. Games and puzzles in guest bedroom closet. The owners really paid attention to detail when decorating the cabin. Everything was just beautiful and so comfortable. Plenty of everything included. The cabin was very clean as well. Perfect for a weekend of relaxation. Just what we needed. Thank you David and Pam for sharing your lovely home. We will definitely be back. Comfortable getaway with attention to detail. Serene location with mountain views! Welcoming owners who add great detail to make you feel as you are home! cabin has comfortable beds and pillows and very capable kitchen if you wish to cook in the cabin. Serene location with mountain views! Thank you for staying with us and for taking good care of the cabin! We appreciate your time in leaving such a thoughtful review and hope you will come back in the future! We have stayed here several times and loved it. Convenient to everything and the cabin has anything you could possibly need. Thank you so much for taking the time to leave a review on Rocky Knob! We greatly appreciate your return to the cabin and hope to have you back again. You are welcome any time! Thank you so much for taking your time to leave your review. We are thankful you chose Rocky Knob for your wife's birthday celebration and that you found everything to your satisfaction. We hope you will stay again! It rained & we didn't care! Snug & cozy! Loved it! You know how you plan your vacation & hope the weather agrees with your plans? For our stay, it rained almost the entire time. Normally, rainy weather would be a huge disappointment...we had places in mind to explore, but we truly didn't mind in the least! The cabin was cozy, well appointed with wonderful furnishings (loved the red leather couch), we had coffee and each other! On Saturday, the rain let up a bit and we did explore Hayesville, NC. While there we ate pizza at a local pizzaria downtown and discovered the Hayesville Friends of the Library Bookstore! Everything in the store, that day, was half price! All, in all, we hope to return to your wonderful cabin! Our stay was peaceful and refreshing....exactly what we needed for that much needed get away for my husband and myself. Thank you so much for the attention to detail in making your cabin home to us! It was wonderful!! Thanks to you both for your kind and thoughtful review on the cabin. We love our place and it warms our hearts when others enjoy it as well. It is a great spot to relax and renew. We hope to have you back! Over Ten Years of Visits and Counting!!!! What can I possibly say to convince anyone that Rocky Knob is an absolutely beautiful cabin tucked into the side of a mountain in Young Harris, GA! For over ten years now, since our son went to Young Harris College, we have thoroughly enjoyed 2-3 visits every year. If you have a student at Young Harris then this cabin is perfect for you!!! Within 3 miles there are 3 wonderful restaurants and a pub. Pam and David are unbelievable owners to work with. As long as they own Rocky Knob we will be regular visitors. If this doesn't convince you how much we always enjoy our stays, we have already booked our visit for the fall!!!! 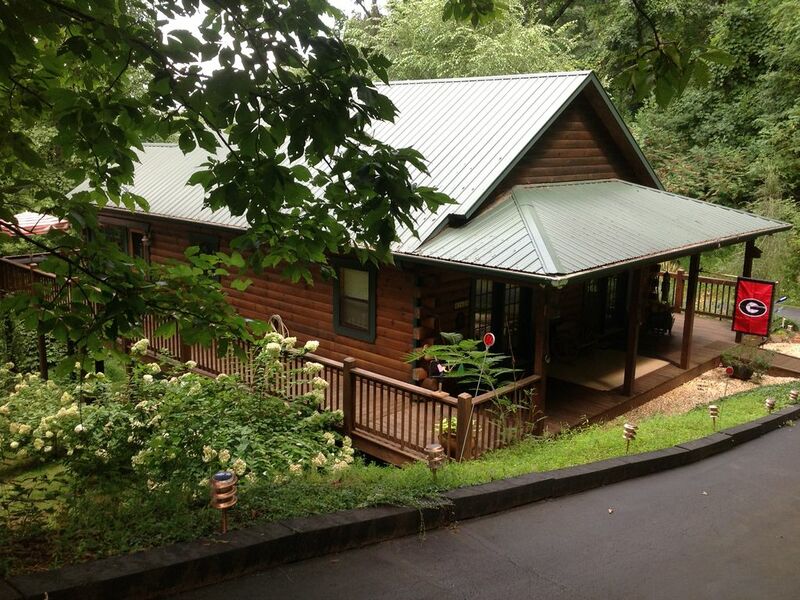 What more can I say, this cabin is conveniently located in Young Harris, halfway between Blairsville and Hiawasse. Be sure to checkout what is happening at YHC, wonderful athletic and fine arts events throughout the school year. Thank you so much for taking the time to leave such a kind review about the cabin and us. We are so appreciative and feel you guys are family. Also, thank you for stating all the great things about the college; it is truly an asset for our area and has many wonderful offerings during the year, including the planetarium. Boating and Jet-skiing @ Lake Chatuge, Events at nearby Young Harris College including programs at Rollins Planetarium and Events at nearby Brasstown Valley Resort and Golf. Holiday pricing (New Year's, Memorial Day, Labor Day, Thanksgiving and Christmas) same as October. Call or email for confirmation of cost.